North Carolina roads are not built exclusively for cars and trucks. All public motorists have a right to travel on the roadways and bicycles are no exception. Bicycles are an important part of the Raleigh, North Carolina citizen transportation system. Residents of Raleigh use bikes to travel to and from work and school, in addition to recreation. Over the past decade, cycling has risen in popularity. No longer are bicycles only considered a mode of travel for children and teenagers, as adults are enjoying bicycles as a recreation and sport in increasing numbers. Due to this increase in cycling traffic, Kirk, Kirk, Howell, Cutler & Thomas believe it is important to share some cycling statistics and address the rules of the road as it pertains to cycling, and how to remain safe when traveling and what to do in the event of an accident. How is a Bicycle Classified? A bicycle is a vehicle, recognized under a special class. The NCDOT defines a bicycle as non-motorized vehicle with 2 or 3 wheels in tandem, a steering handle, 1 or 2 saddle seats and pedals by which vehicle is propelled. What Does North Carolina’s Bicycle Classification Mean? Under the special class, bicycles are provided the same rights to the roadway as trucks and cars, and must exercise responsible driving practices such as obeying traffic laws, especially those designed for safe travel and stopping at stop signs and traffic lights. NC bicycle laws allow bicyclists the freedom to ride on and off road. The state does prohibit cycling on interstates and controlled access highways. A controlled access highway does not have any driveway connections or at-grade crossings or intersections. On average there are 20 cyclists killed in the state each year, with 1 out of 6 being under the age of 16. About 20-30% of all bicycle related injuries involve a collision with a motorized vehicle. These injuries are usually very serious and sometimes even fatal. Many factors play a role in bicycle accidents, yet a cyclist’s location (such as an intersection), position on roadway (lanes, shoulder) and riding direction make the most impact. Bicyclists are commonplace in all areas of the state. However, the majority of accidents occur in high population/traffic volume areas with 70% or 2/3rds of accidents occurring within municipal city limits. Wake County has the highest total of bicycle/motor vehicle crashes from 2008-2012 with a staggering 13.3% of the state total. Raleigh ranks 2nd in crashes within cities, with 2.1 accidents per 10,000 residents, or 8.8% of the NC total. 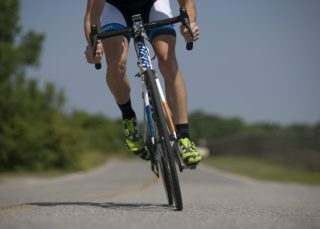 Male cyclists are involved in 85% of accidents over a 5 year period according to a NCDOT report. Location of travel plays a large factor in bicycle crashes. A whopping 76% of collisions occurred on two-lane, undivided highways. Although roads with high speed limits can be more disastrous, the majority of crashes occur on roads with posted speed limits of 35 mph or less. Of all the cyclists killed, 82% were struck when traveling on roads with speed limits of 40 mph or higher, with the majority occurring in 50-55 mph zones. Regardless of the rate of posted speed limits, the data suggests the majority of crashes (49%) occur at intersections. When Do Most Cycling Accidents Occur? Not surprisingly, most bicycle accidents during warmer months when being outdoors is more enjoyable. The summer months, May-September receive 54% of the annual North Carolina bicycle accidents. The day of the week is a contributor as well, with Friday receiving 16% of the weekly share. Time of day is another factor to consider, as 34% of accidents occur between 2-6 pm and 25% from 6-10 pm, with ¾ of accidents taking place during daylight hours. Weather factors into when many cyclists are on the roads. Clear weather is call for most cyclists to hit the roads, and due to this 83% of crashes are involved during this time. Cloudy weather follows with 12.5% and rainy, snowy, foggy weather only contributes 4% of accidents. However, wet roads and standing water cause significantly more accidents than rain. To avoid an accident, visibility is crucial. It is recommended to install front and rear lamps that can be seen at least 300 feet from a bicycle. When approaching a stop light, Raleigh cyclists must stop and wait until the light turns green. This law should NOT be ignored. If a cyclist passes through a red light and collides with a motorist, the cyclist will most probably be cited with fault. If a Raleigh traffic light is malfunctioning or your bike does not trip the sensor, approach the intersection with caution. Wait until there is an opportunity for safe passage and proceed with caution. Knowing the proper way to use hand signals will help prevent possible collisions. If you cannot safely operate a bicycle with one hand, make every attempt to communicate your intentions with body language and other signals. Which Lanes or Side of the Road Should a Bicyclist Use? When turning, Raleigh cyclists should use the left lane for left turns and the right lane for right turns. If there are two left turning lanes, the cyclist should use the right most, left turning lane. If continuing straight through the intersection, a cyclist should use the through lanes rather than the “right turn only” lane. Stay safe by always using the right most lane when heading to your destination. North Carolina law states, “riders must ride in the right lane, as close as practicable, to the curb or right side of the road.” The law also states, “Act like a vehicle” and “ride in the direction of traffic.” A cyclist should NEVER ride facing oncoming traffic as this is the leading cause of collision between motorists and cyclists. However, be careful allowing too much open space in your lane. A Raleigh motorist could use that space to pass and not take into account the actual width of their car or truck. It is common for cyclists to be clipped by the passenger side mirror, which can cause serious injury. To avoid this, it is advisable to ride slightly closer to the center of the lane. This can be an incentive for passing motorists to use the left lane when overtaking a bicyclist. When riding single file or individually along roadways with speed limits exceeding 35 mph it is highly advisable to ride center-right of the right hand lane, and using the whole lane when traveling on high speed roadways to avoid hazardous travel. When approaching a cross walk, it is not necessary for a cyclist to dismount. However, all cycling enthusiasts should enter or pass through crosswalks with caution, looking out for motorists and pedestrian traffic. A parked car has the capability of causing serious injury. Try riding 5 feet from parked cars to prevent being struck by an opening car door. Not only can the door opening cause significant injury, it can thrust a cyclist into moving traffic. Can Raleigh Cyclists Use the Sidewalk? Often in heavy traffic areas, Raleigh and other municipalities have sidewalks for pedestrians. Cyclists should seek the legality for their area to determine if riding on sidewalks is allowed. You can search the municipal code for the city you ride in for more information. If riding on a sidewalk is legal in your area, ride with the flow of traffic for maximum visibility. As cycling grows in popularity, biking in groups will become more prevalent and the NCDOT has addressed the need to regulate large groups. First, group riding with 30 or more cyclists will require an official road event permit. Group organizers should consider the need for traffic control and coordination with emergency responders in the event of an accident. In addition, it is good practice to post information on planned rides and cycling routine on publicly accessible websites. If a cyclist is involved in a crash with another bicycle, motor vehicle, pedestrian or even by unavoidable hazards that have been unattended by a business or municipality, there are opportunities to recover compensation for damages. Basically, a bicycle crash does not have to be auto related. A claim can be made against the home or business owners insurance. DO NOT repair or alter your bicycle after an accident. This is valuable evidence that will be needed to address your claim. As a victim of a bicycle related crash, you can pursue criminal charges against an offender. Make sure that you do not negotiate or speak to the driver’s insurance agent or adjuster. Any communication could potential reduce your attempt at a recovering a claim. Having an attorney experienced in bicycle accident cases communicate with the offender or their insurance will be your best chance at receiving an appropriate settlement. Contact Our Experienced Raleigh Bicycle Accident Lawyers and Personal Injury Attorney’s for Help with Your Case! As more cyclists take to the Raleigh roadways, collisions will become all too common. It is important that you seek a legal team with the knowledge you need to win your bicycle crash case. Often, when bicycle crashes or incidents of harassment by motorists occur, the police officer handling the scene won’t be versed in the exact nature of the laws and can potentially mishandle the situation. If you have been involved in a bicycle related event and need representation, our team at Kirk, Kirk, Howell, Cutler & Thomas will be ready to serve you. Call our Raleigh personal injury attorney’s at (919) 615-2473 or complete the online contact form below to speak with a Raleigh bicycle accident attorney.